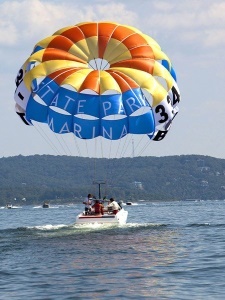 With just about every other lake and outdoor activity available in Branson, of course you can parasail! Table Rock Lake and the surrounding tree-filled hills are simply stunning from this relatively short, but still thrilling, distance up in the air. It’s certainly a closer view than you’ll find on any helicopter tour. On Table Rock Lake, you’ll find services that provide a brief safety-training session, not too difficult or too much to remember, and as many as six can go out as a group. Up to three can sail together, with some weight limitations. The marina at the Chateau on the Lake Resort, Spa & Convention Center has access to this parasailing service. A bit different than parasailing, but still an exciting adventure over the water, the new sport of flyboarding can be found on Branson’s Table Rock Lake. 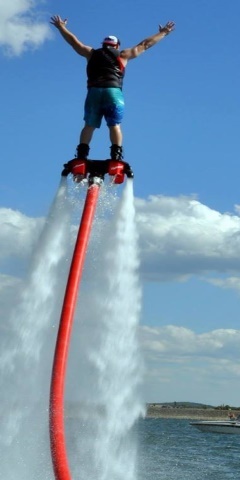 Invented a mere three years ago by a French watercraft enthusiast, this unique, powered device allows you to climb out of the water and into the air! Riders stand on a board connected by a lengthy hose to a watercraft. Water is forced under pressure to a pair of special boots with jet nozzles underneath. It’s an incredible thrill that’s still being discovered by water sports fanatics around the world, and you can experience it firsthand in Branson, Missouri! When you’re ready to spend a little exciting time over the water in a fun and different way, remember that Branson is well-prepared to put you there!